I was very lucky yesterday to be in attendance when Ken Loach, legendary film director and possibly the most famous person to ever hail from Nuneaton (until I someday overshadow him. In my pathetic little dreams...), screened his 1984 documentary 'Which Side Are You On?' at the Showroom in Sheffield as the opening film in a series that commemorates the Miners' Strike of 1984-5. It was a terrific opportunity not only to see a documentary that I probably wouldn't otherwise get a chance to see, and if I did I certainly wouldn't be seeing it on the big screen, but also to hear the thoughts and opinions of one of the great film-makers of the last 50 years. The audience, however, had other plans. Before we get to that, let's talk about the film. The backstory of 'Which Side Are You On?' is as fascinating as the film itself. Ken Loach wanted to make a documentary about the Miners' Strike almost as soon as it started, and he went to the various different channels in an attempt to get funding and distribution for the film. He was turned down by all of them. Then, Loach used his connections with Melvyn Bragg to get The South Bank Show to commission the film, though instead of focusing on the strike itself, Loach would detail the culture of the strikes, through the poems and songs written by the miners themselves, though he would also contextualise them within the culture of police brutality and media bias that allowed them to be created. 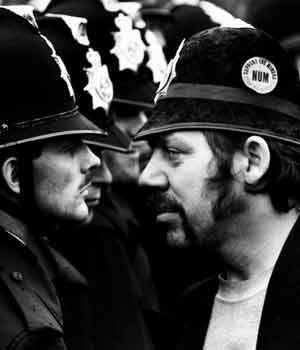 Needless to say, a film that focused solely on the miners' side of the struggle and highlighted the violence meted out against them by the police was not well received, and LWT refused to screen the film when it was originally scheduled for broadcast, in the autumn of 1984. Loach took the film to an Italian festival where it won an award, this helped to change the minds of broadcasters and the film was eventually screened in the spring of 1985. Those few months, however, had seen a crucial change in the strike, and much of the spirit and defiance demonstrated in the film had, if not died away, then had certainly been tempered by the length of the strike, by the brutality of the police and the biased depiction of them in the media; a film that had been intended as document of the struggle and the strength of its purveyors had suddenly become a eulogy. That eulogistic aspect is still very present in the film now and it saddened me that I was not alive at the time that the strike was taking place since all I could think of whilst watching it was ''How terrible it is that they lost''. The film is akin to a photograph taken of a child right before they are hit by a car; there is an optimism, a hope there that is shattered by the viewers' knowledge of what came next. As someone who, as I've already said, was not alive when the strike occurred, I've never really been given a view of the miners and their struggle other than the official one. Admittedly, my left-leaning, Thatcher hating credentials meant that I always fell on the side of the miners', but I never got a sense of what their experiences were like from the official narrative. As such, Loach's film was a truncheon to the head for me, as it revealed something that I would not have expected; a vibrant culture of protest and opposition. The sheer volume of songs, poems and cartoons that Loach uses in a mere 60 minute documentary gives just a taste of what must have been a thriving cultural force that inspired the miners. In order to put this work into context, Loach uses archive footage and still photographs of, amongst other things, police beatings, marches and scabs to illustrate what the people were writing and singing about, as well as what they were fighting against. Loach is clearly on the side of the miners and sought to offer an alternative to the official stance of the government and, shamefully, the media that they were just a group of malcontents trying to bring the country to a standstill for their own selfish gains. Loach aims his baleful gaze at the media towards the end of the film, showing just some of the headlines that were run about the strike, almost all of which referred to the strikers as 'thugs', and contrasts them against the dearth of reports that were critical of the police and their tactics. At the heart of the documentary is a desire to show the spirit of the strikers and their determination to win. Despite the aforementioned prior knowledge that they would fight and ultimately lose, I felt that strength in them and that they thought that they could win, despite the overwhelming odds that were stacked against them. Of course, the film is openly partisan and wants you to feel those things, but that doesn't make the emotions that it raised in me, someone with no first-hand experiences of the strike or much of a frame of reference for it, any less real or valid. 'Which Side Are You On?' is a fascinating piece of polemic and an important historical document that records just some parts of a culture and a mindset that has largely been forgotten (apart, as Loach himself pointed out, from the poetry of Mogg Williams, which has been collected and distributed so that a wide audience could potentially find it). After the screening of the film, Ken Loach came back and did a Question and Answer session with John Cunningham, a lecturer at Sheffield Hallam University but a good bloke all the same, and the audience. Well, I say 'Question' and Answer, it very quickly devolved into a 'Rant' and Answer session since most of the people in the audience seemed to have been involved with the strike in Sheffield, either directly or indirectly, and felt that this was an opportunity to share their experiences and opinions on why the strike failed. A good idea, in theory, and it was clear that the film had stirred up some emotions that people felt they had to express, but it got quite boring and intimidating (an odd combination) at times as it became quickly apparent that I was surrounded by ideologues. The focus on minutiae quickly became boring and probably would have been palatable if Ken Loach had been allowed to speak but often he was not asked any questions and just had to sit as people ranted and raved about their experiences, not the film. I had hoped to ask a question about whether or not any collections of the songs and poems had been made, apart from the work of Mogg Williams, but I just got so intimidated by the general atmosphere of the crowd. I felt that if I revealed that I had the gall to be under 35 and had the temerity to ask a question directly related to the film then I would have been lynched, so I was forced to sit down and watch as people wasted an opportunity to ask some questions of one of the most interesting and important film-makers this country has produced. So, apart from the way in which the evening was soured, I was glad to have gone since I was able to see a great, emotive film and was in the presence of its director, even if he was somewhat quiet for most of it.